Corporate Culture – An Oxymoron? The approach to sentencing determinations in Australia is termed the “instinctive synthesis”. This involves a largely discretionary judgment whereby courts determine all relevant considerations and then prescribe a designated penalty. The hallmark of this approach is that courts are not permitted to set out the weight that is accorded to any particular consideration. Instead, a global judgment is made regarding the appropriate penalty. This approach has been criticised for lacking in transparency and consistency, but there has been little empirical testing of such assertions. 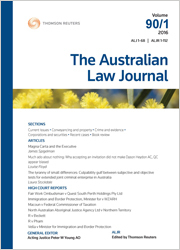 This article adds to the literature in this area by reporting the findings of a wide-ranging study into sentencing outcomes for driving offences in four courts in Victoria. The study is significant because it relates to over 12,000 sentencing determinations over a four-year period and compares sentencing outcomes in a single jurisdiction – where identical legal principles and rules operate. It notes that there is a high degree of inconsistency regarding sentencing outcomes between the courts, with the use of imprisonment in one court three times higher than in another. The results of the study cast doubt over the legitimacy of the instinctive synthesis approach, from the perspective of securing the rule of law virtues of consistency and predictability. Dispute resolution by expert determination has become an increasingly useful tool in today’s fast-paced commercial world. Nevertheless, parties dissatisfied with apparently binding determinations routinely seek to challenge the validity of those determinations in the courts, thereby undermining the purpose this procedure might otherwise serve. This article seeks to foster a wider understanding of the merits of challenges to expert determinations by considering the principles having regard to which such challenges may be made, in addition to the various circumstances in which courts commonly uphold or overturn determinations. This article concludes that there is only a limited range of circumstances in which challenges will succeed, and that the specific error made by the expert in respect of which a challenge is made ought to be closely scrutinised before it is sought to be overturned. Finally, this article examines the remedies that courts commonly grant on a successful challenge of a determination, and the juridical basis on which courts may fashion an appropriate remedy to suit the unique circumstances of a case. Australia has an unenviable record of species extinctions, ecological fragmentation and biodiversity decline. Against that backdrop, anthropogenic climate change is emerging as a significant new threat to Australia’s biodiversity. This article argues that the explicit and implicit purposes of conservation laws are to preserve the status quo. These laws typically reflect a false presumption that nature is “stationary”, and that biodiversity can be preserved indefinitely within historical, “native” distributions and species compositions. This presumption is demonstrably false and, without legislative reform, conservation laws based on static purposes will continue to be ill-equipped to facilitate adaptation-oriented approaches to conservation. Commonwealth and state and territory legislatures must ensure that legal frameworks for conservation provide Australia’s rich biodiversity with the best possible opportunities to adapt and persist in a rapidly changing world. For the PDF version of the table of contents, click here: ALJ Vol 92 No 7 Contents.